This traditional Korean soup is served during the cold winter months to help prevent illnesses caused by the chilly weather. The addition of ginseng helps boost your immune system. 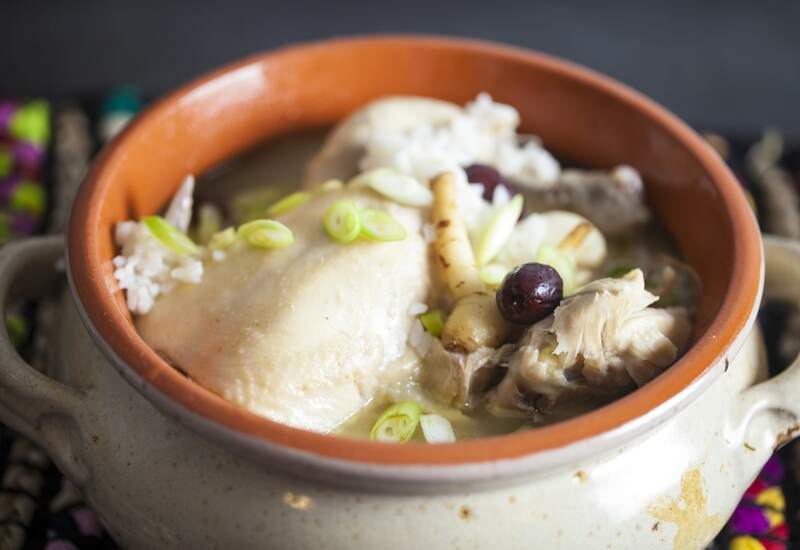 Cornish game hens are cooked with jujubes, ginseng, garlic, and rice. The dish is then seasoned with sesame oil, salt, pepper, and black sesame seeds. Chopped scallions are sprinkled on top for garnish and additional flavor. This unique dish might seem daunting at first, but once you realize it is just a one pot meal, you realize it is actually easy and effortless! Jujubes are actually a member of the buckthorn family! These red dates can be purchased in Korean markets and through online stores. Per Serving: 632 calories; 38g fat; 37.4g carbohydrates; 33g protein; 168mg cholesterol; 1951mg sodium. This chicken soup is so hearty! Reminds me of Asian comfort food. I'm always looking to expand my palette and was pleasantly surprised by how flavorful this dish was. We made a batch of this Korean soup the other day, it was really good. The beef broth with garlic tastes amazing. This is definitely the soup to make when you're coming down with a cold, ginseng works like a charm.